How well does The Heart iBook teach basic cardiac anatomy? 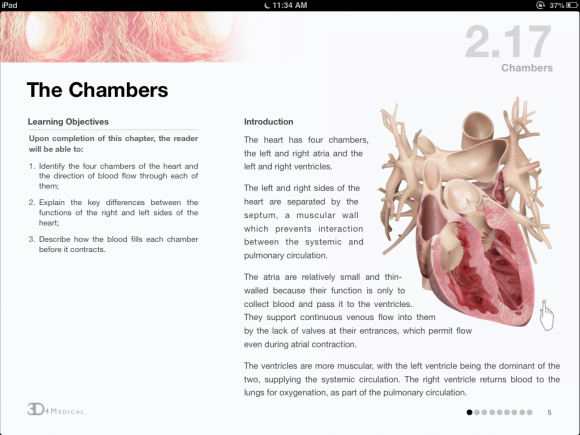 The Heart is a medical iBook adaption of the Heart Pro III app for iPad by 3D4 Medical. 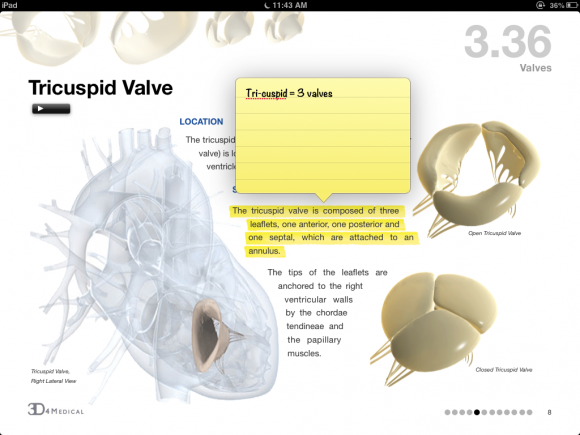 This text is geared towards beginning level anatomy students at an undergraduate level. The original Heart Pro app is organized like an atlas, with limited guidance through the different structures shown. 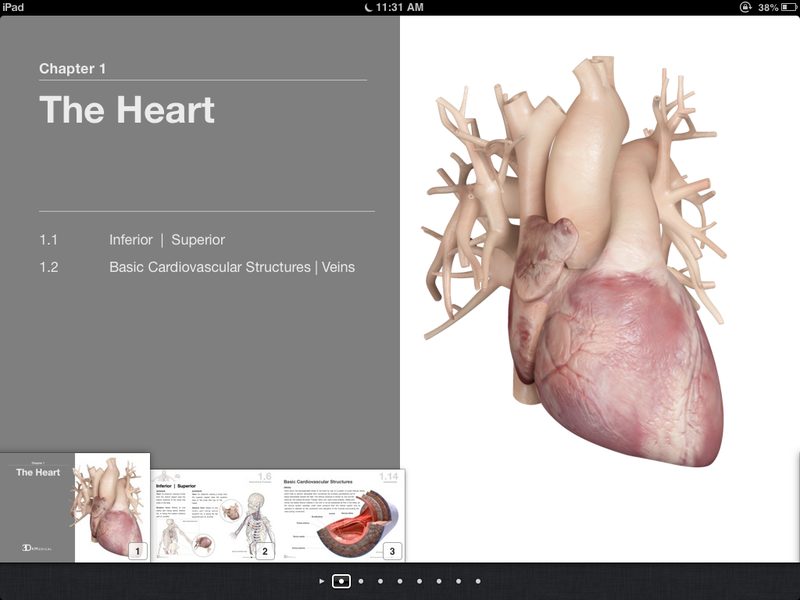 That app is appropriate for medical students with more background on cardiac physiology. 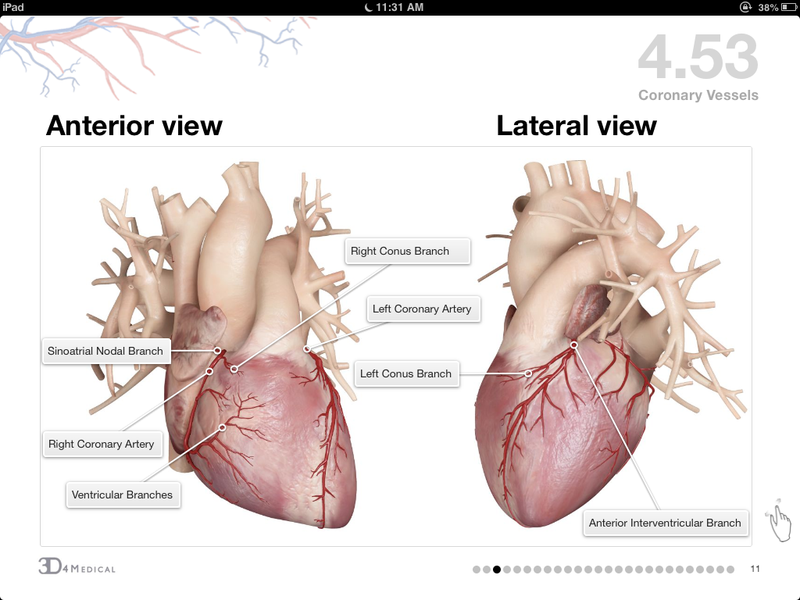 The Heart iBook includes the graphics from the original app, but is organized as a more comprehensive guide for those just starting to learn cardiac anatomy and physiology. 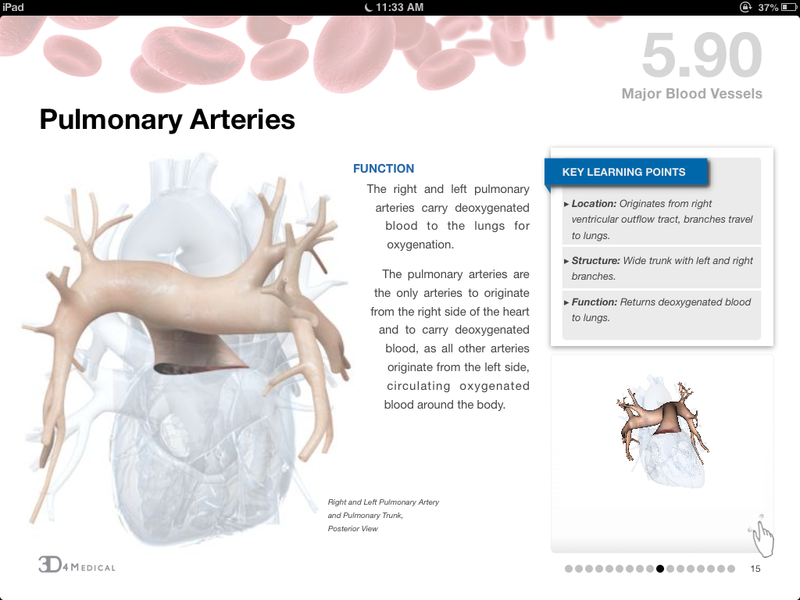 The interactive iBook format allows the authors to include video animations, review questions and interactive 3D images with their text. The text is organized into seven chapters with learning objectives clearly stated at the beginning of each section. Each chapter starts with an animation demonstrating a central concept. In the page below, the heart image starts beating when selected. 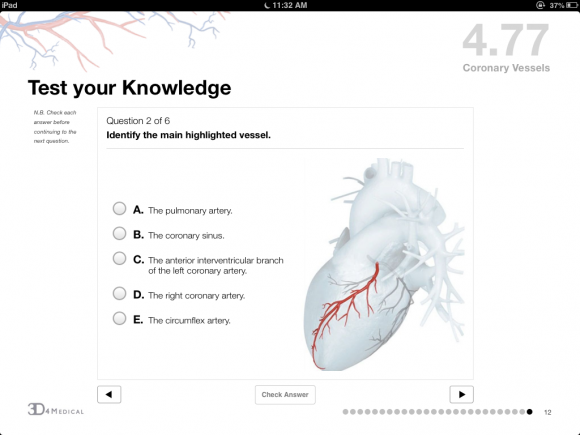 Icons like the hand–shown next to the heart image–help the reader identify interactive components. 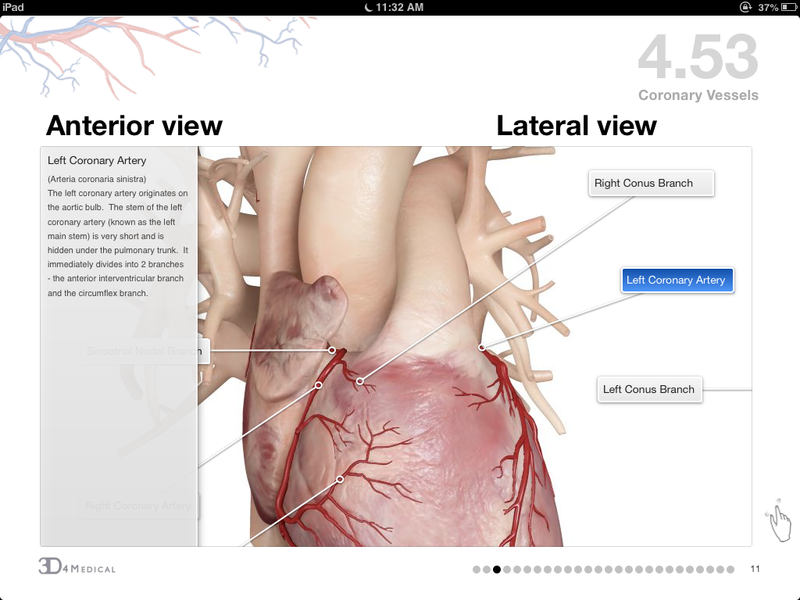 Interactive images show anatomic labels that expand with a description when selected. The screenshot below is a zoomed in section from the same interactive image shown above. Each chapter ends with several review questions. Checking the answer will show whether it is correct or not, but does not explain the answer. This is a limitation inherent in the iBooks Author software, and is not ideal from an educational perspective. A teaching strategy used frequently in this text is to highlight a specific structure on a complete 3D image of the heart. 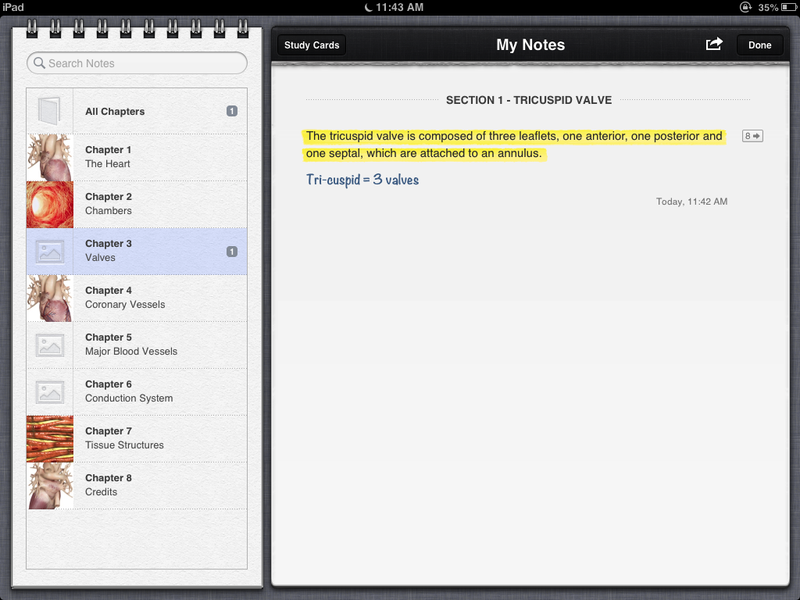 For example, the pulmonary arteries below are highlighted. The reader can then open up an interactive 3D image (shown in the bottom right of the screenshot above) to view the structure in full screen. 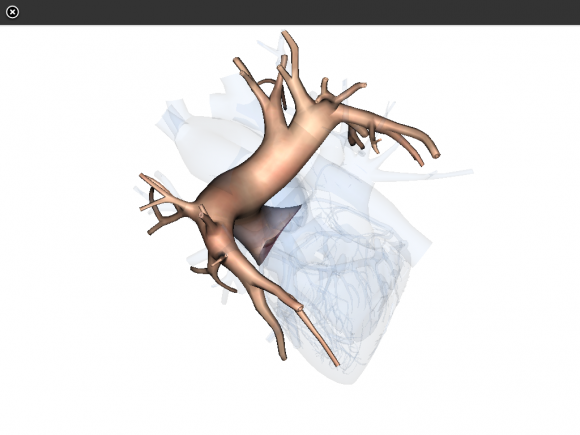 The reader can also manipulate the 3D image to view the highlighted structure from all angles for a better understanding of how the structure is incorporated into the complete organ. This strategy gives learners a hands on feel for the anatomy they are studying, an experience usually reserved for gross dissection labs. Readers can highlight and make notes in the text. These notes and highlighted sections are compiled in the My Notes section, and can be viewed as a list, or as study cards. Unfortunately, medically focused interactive iBooks like this one are not easily identifiable on iTunes. Textbooks are divided by topic, but The Heart isn’t categorized under life science, instead ending up in a miscellaneous section. In order to make this technology appealing to health care providers, iTunes needs to organize content so that it is appropriately visible. This book is an example what textbooks should be like. The interactive components and phenomenal multimedia take advantage of available technology to empower learners to achieve their educational objectives while actually enjoying the process. User Interface – 5 – Very easy to navigate. Multimedia usage – 5 – Fantastic graphics, wonderful interactive images. In addition, multimedia is used wisely to achieve specific learning objectives. Price – 5 – Very reasonable. Real world applicability – 3 – Applicability will depend on the goals and background of the learner. As a resident physician, I enjoyed reading this text and playing with the graphics, but the content was definitely basic.